I missed Quick Takes last week because we were enjoying the sights and food in Boston. There is nothing like a decent restaurant when you live in the middle of nowhere PA without decent restaurants. Does it seem like I'm bitter? I'm not, I adore our community. It's just that I am not used to this type of living. We've only been here five years. I probably just need another forty or fifty to adjust. Adoption Update: We feel like a lot is happening, and happening fast, but it's not the type of stuff that transfers well to blogging. A lot of paperwork is being completed and approved and we are preparing ourselves to begin looking at birth mother profiles. At the beginning of the summer we had a September 1 goal to begin our waiting and if things continue like this we should make our goal. When you hear about someone adopting, it is impossible to know the "behind the scenes" details unless you've "been there- done that" before. I always thought, "How wonderful and fun that they've adopted." Now I think, "They went through this, I can do it to." or "They went through this MORE THAN ONCE!?!?!" One of my precious sons told me today why shoes are called flip-flops. "They are flip-flops because when you run in them they go 'flip-flip-flip' and then when you fall you go 'flop!'." So sweet and cute. Sometimes I wish I could freeze this time right now and get my fill. Speaking of cute, here's Malcolm playing with the plastic soldiers in the schoolroom. He is so precious! Three photos should count for at least three Quick Takes! 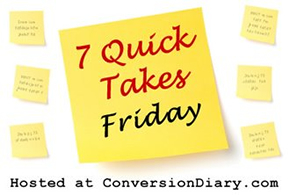 Join Jen over at Conversion Diary to read more of these!